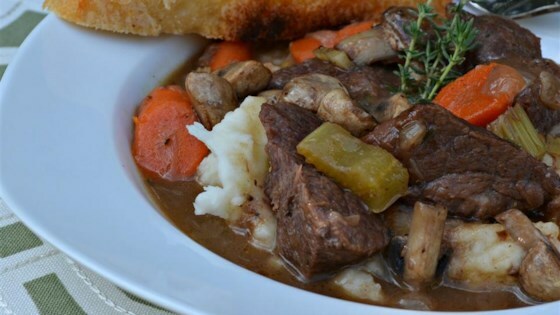 "This recipe for beef Merlot is one of my favorites, and a take-off on the venerable beef bourguignon, beef braised in Burgundy wine. Serve over mashed potatoes." Heat oil in a large Dutch oven over high heat. Cook and stir beef cubes in hot oil until browned on all sides, 10 to 15 minutes. Transfer meat to a plate. Cook and stir onion, butter, and a pinch of salt in the Dutch oven until onion begins to sweat. Stir flour into onion mixture; cook and stir until onion starts to soften, 3 to 4 minutes. Pour wine into onion mixture; bring to a simmer and cook until wine is reduced by half, about 10 minutes. Return beef and any accumulated juices to the Dutch oven. Add beef broth, carrots, celery, thyme sprigs, bay leaf, and salt. Bring to a simmer, cover the pot with a lid, and simmer for 1 1/2 hours on low until meat is almost tender. Remove cover from the Dutch oven and simmer uncovered until meat is tender and stew is thick, about 30 minutes more. Season with salt and pepper. Delicious! Added mushrooms as well. Offered it over garlic mashed potatoes OR mashed ruttabegga (mashed with butter, cream, salt and white pepper). Both were lovely! I have made this recipe and my family loves it! Very easy, actually can use dry spices as well as cabernet or pinot noir wines. Lovely recipe! yummy as is. sauce was thin first day, thickened when cooled down on second day. will make again (and again!). i used good quality non-alcoholic wine with good results.